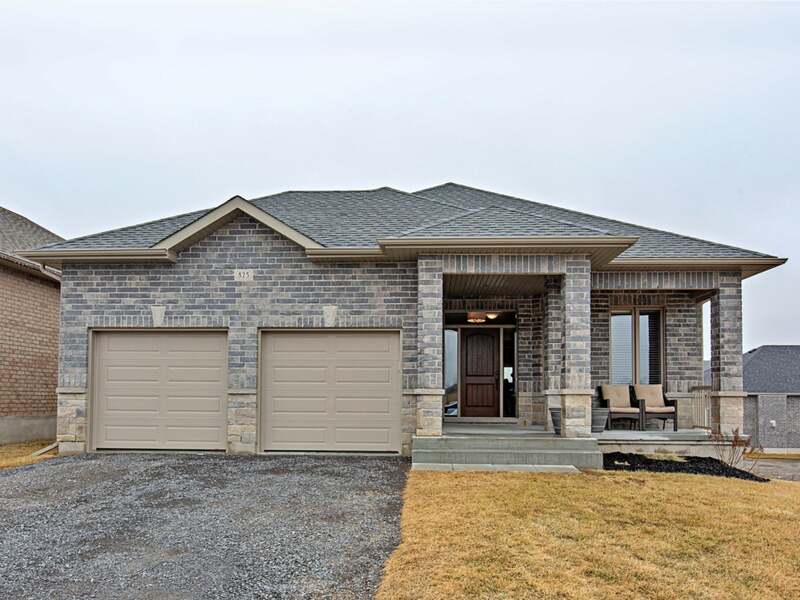 Nearly new 3 bedroom, 3 bath bungalow with full stone/brick exterior. Featuring over 2,700 sq/ft of finished living space plus 9 ft ceilings and maple hardwood / ceramic tile throughout the main floor. Gorgeous custom kitchen with granite counters, tile back splash, extended upper cabinets, crown mouldings, under cabinet lighting and island w/extended breakfast bar. Open concept living and dining room with tray ceiling, pot lighting, gas fireplace with floor to ceiling stone and patio doors to large 14’ x 10’ deck. Main floor laundry/mud room access from double garage w/lots of storage. Large master bedroom with walk-in closet complete with built-in organizers and beautiful 4-piece ensuite with large vanity, double sinks and 5ft shower w/glass doors. Hardwood stairs lead to fully finished lower level with large rec room, laminate flooring, pot lighting and large window plus guest space w/closet and stunning 3-piece bathroom w/tile & glass shower. Plus driveway to be paved, central air, HRV, California shutters and so much more! Nothing to do but move in and enjoy, steps to the park and nature outlook and ideally located just minutes to all west end amenities and 401. Lot Size 49 x107 Sq. Ft. Please send me more information on 825 Windermere Drive, Ontario. Thank you.